Plug & play. 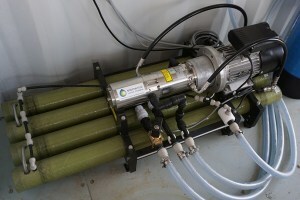 Solar powered battery desalination. 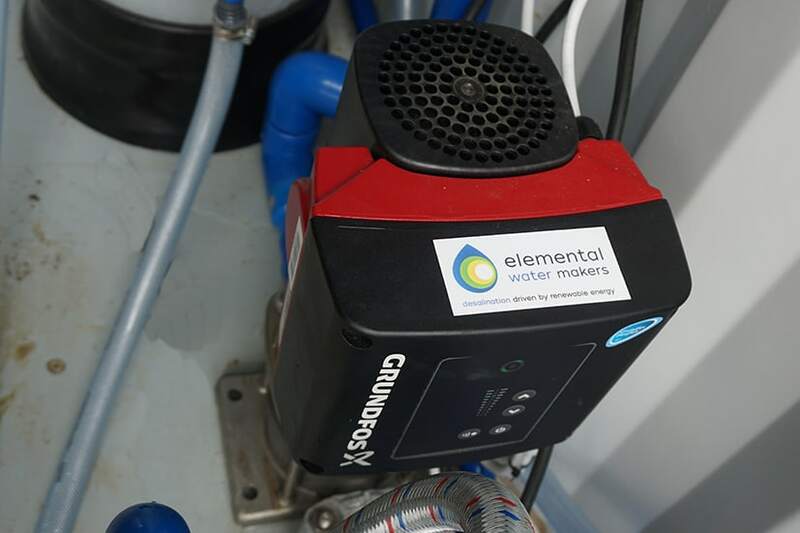 To enjoy independent clean water at any location, we have a solar powered reverse osmosis solution assisted by batteries that works everywhere. 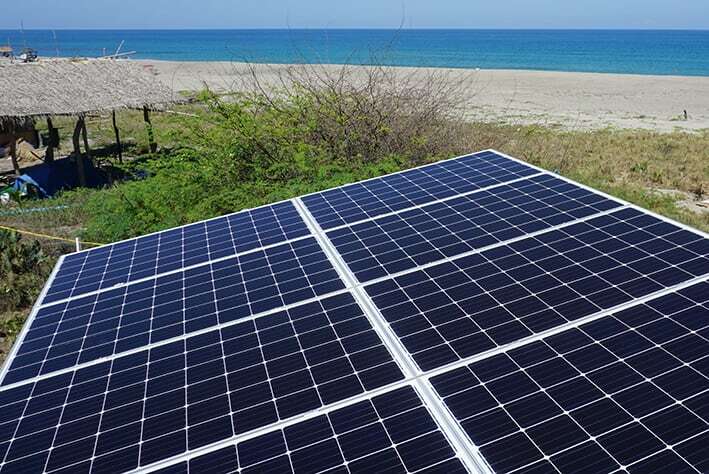 Combined state-of-the-art solar panels and battery technology allows efficient reverse osmosis, while minimizing battery size. The batteries used require no maintenance, are suitable for warm climates and enjoy a long lifetime. This plug & play off-grid solution is containerized to be quickly commissioned in a matter of days. The solar panels are placed on top of the container. As alternative, all components can be integrated in preferred locations, to avoid impact on existing infrastructure and limit the footprint. The high-efficiency solar powered reverse osmosis is equipped with remote monitoring for control and designed for simple operation. 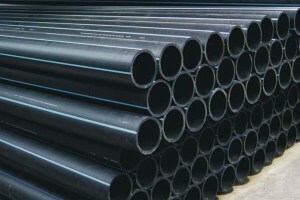 All components are purpose-built to survive corrosive environments and ensure a long lifetime. 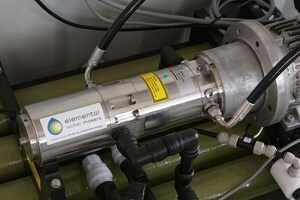 Solar energy reverse osmosis is ideal for remote applications with potable water generation below 3 USD per 1000 liters. Its production capacity can be doubled using a hybrid solar-grid desalination version. It runs on solar energy during the day and uses an existing energy supply during the night to reduce the payback time even more. 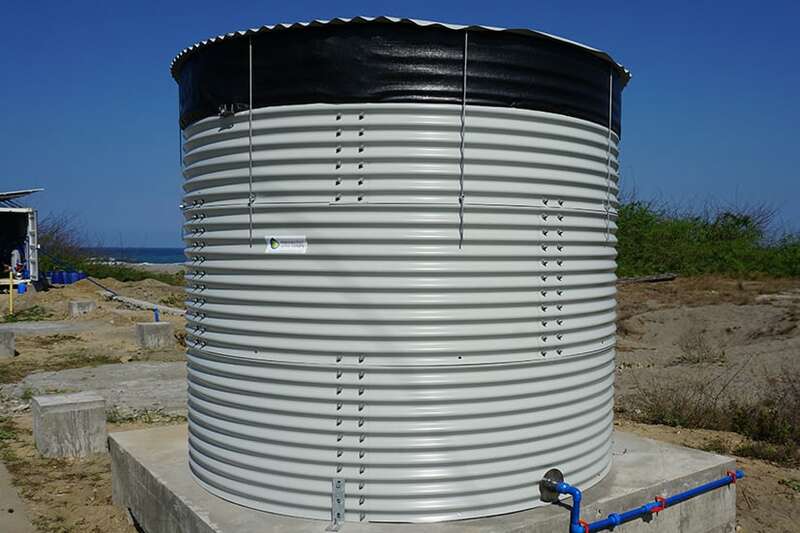 The units are available already at a few m³ per day for remote communities, up to millions of liters of potable water per day for entire islands. 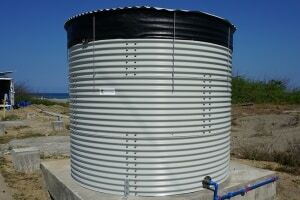 Solar desalination battery reference: Philippines. 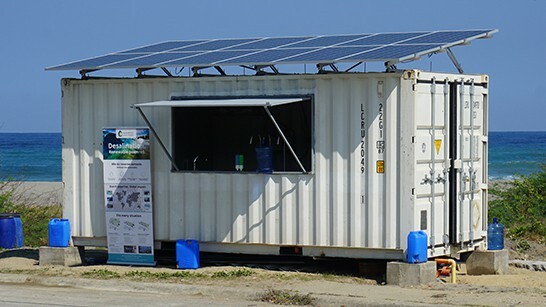 Water kiosk using solar powered-grid hybrid desalination. The batteries we use are maintenance free, are suitable for daily use in warm climates and ensure a +15 yr lifetime. 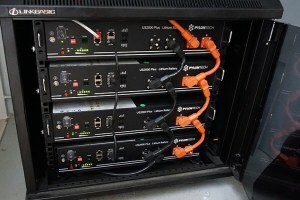 By minimizing the required battery size we are able to limit the investment. 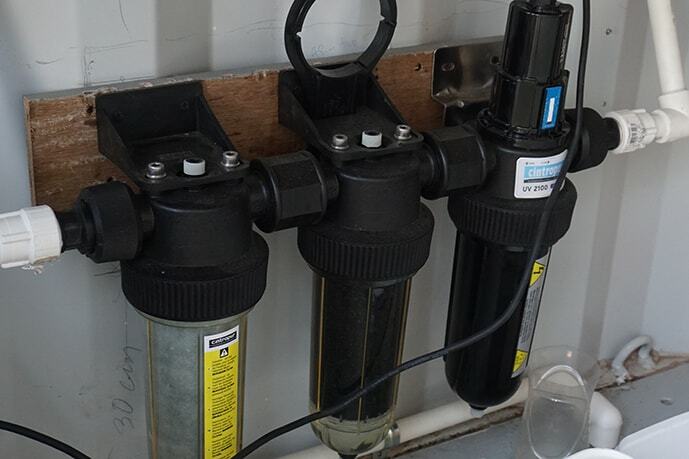 Most pumps have to be replaced yearly when used in salt water. We believe in quality and reliability and work with efficient variable frequency pumps who can withstand (which are suitable for) warm seawater applications, such as titanium or 904L pumps. 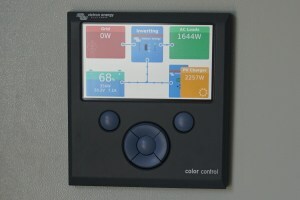 Stress-free operation is ensured by remote monitoring, control and automation. To avoid frequent replacement, the membranes are automatically flushed with fresh water at every shut-down. 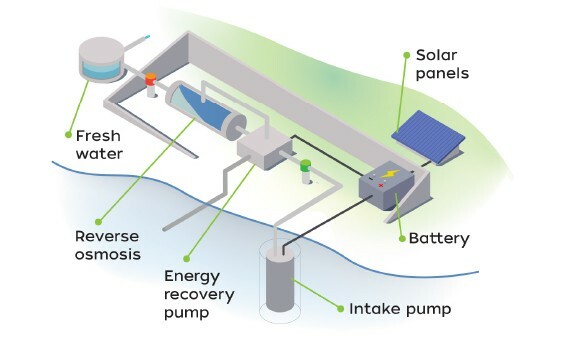 High-efficiency desalination (< 3 kWh/m³) is enabled by re-using the brine pressure, even for small-scale production. 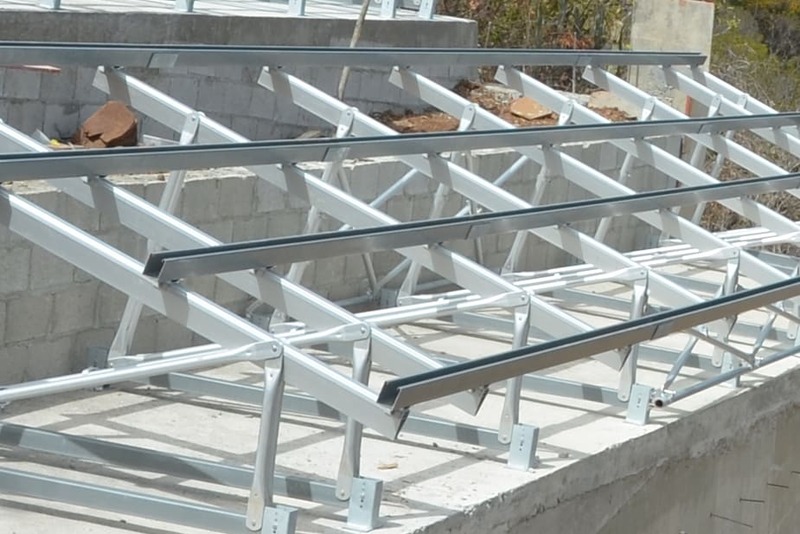 The maintenance-free energy recovery systems are constructed from (super) duplex steel. 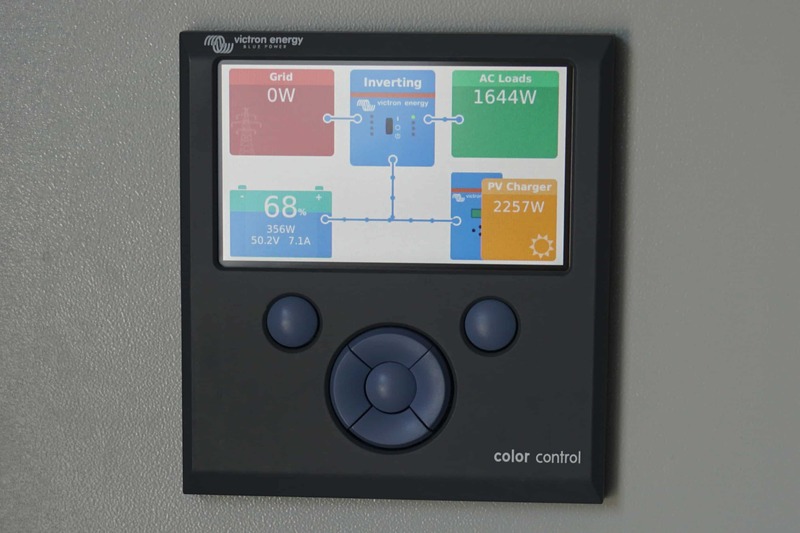 The units are equipped with GSM-based monitoring for remote control and alarm messaging. Check in on your water supply, anywhere, anytime. Example case of solar RO using batteries. 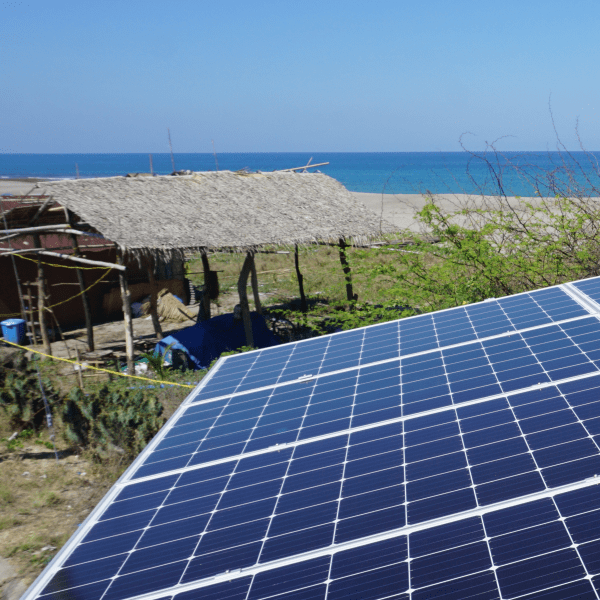 A community with access to safe and affordable water thanks to solar desalination. The community relies on water that is trucked in on a daily basis. The results are a questionable quality upon delivery and a high water tariff of 6 $/m³. Lacking an alternative, the people are forced to spend a majority of their limited income on water, without the assurance of good quality and sufficient availability. This changes completely when a decentralized solution of Elemental Water Makers is put in place. The solar powered reverse osmosis solution, which can be operated to produce 5 m³/day off- grid using only solar energy. There is also the option to produce 11 m³/day in hybrid mode making use of grid or generator power during the night. 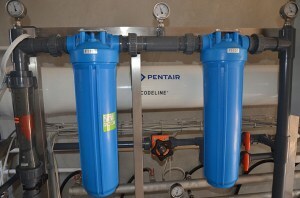 The solution allows the people to enjoy savings on the water expenses of 75% and total savings of over 300.000 $. The solution’s payback is 2.5 years. 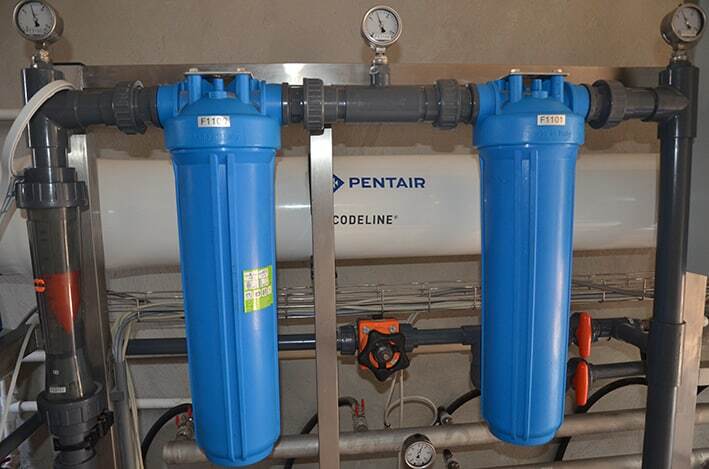 The community now has high-quality potable water on-site, without the dependency of water trucking and associated carbon emissions, saving 10 ton CO2 per year. The solution leads to empowerment, jobs and possibilities for education. Over $300.000 in total savings. Become self-sufficient & save 75%.